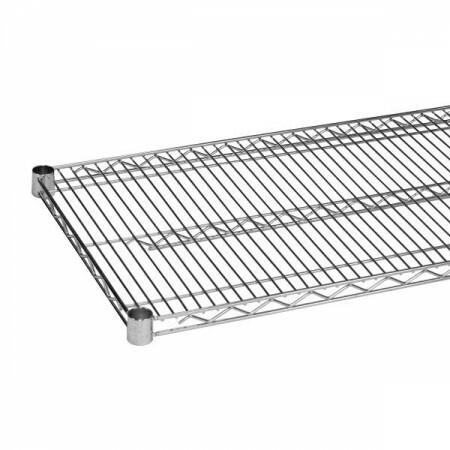 $18.99 Royal ROY S 1436 Z Polycoated Zinc Wire Shelf 14" x 36"
$36.99 Advance Tabco EG-1436 Green Epoxy Coated Wire Shelf 14" x 36"
$15.87 Winco VC-1436 Chrome Plated Wire Shelf 14" x 36"
$17.02 Winco VEX-1436 Epoxy Coated Wire Shelf 14" x 36"
Perfect for adding a large, wide storage space to your commercial kitchen, the Thunder Group CMSV1436 Chrome Wire Shelving 14" x 36" is the basis for building a durable shelving unit. To keep your stored items clean, this shelving boasts an open wire design that allows for proper air circulation to prevent dust accumulation. Made from heavy-duty chrome-plated metal, this NSF approved wire shelving is rust resistant and strong enough to hold heavy items.